Postseason bowl games are often useless, but they can build up the draft stock of rather unknown players who finally get to play on the big stage. 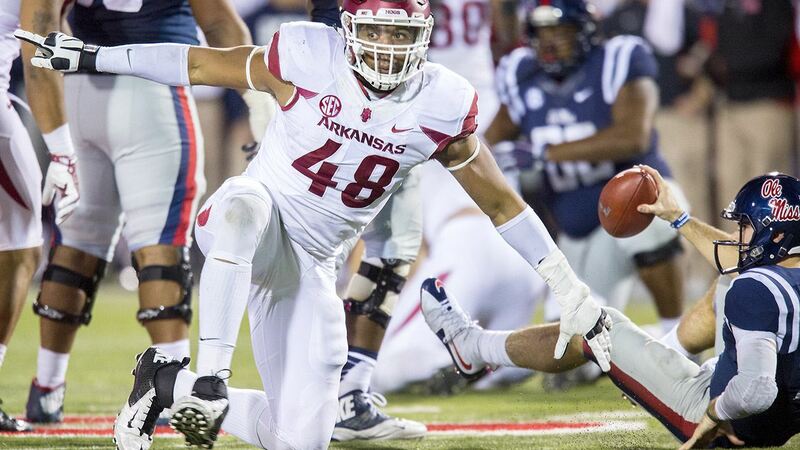 Arkansas defensive end Deatrich Wise Jr. is one of these players, who while spent his time in the SEC, has been overlooked by many draft pundits over the last few months. The East-West Shrine Game changed that. Wise dominated the all-star game, finishing with seven tackles, one and-a-half sacks, and a key forced fumble. With this performance, Wise alerted the world of his presence, and raised the eyes of everyone around the league. After taking a look at Wise’s college tape, I am convinced he can be an impact player at the next level. At 6’4″ 278 pounds, Wise has the ideal bulk for a 4-3 edge player. His 35 inch arms are also impressive and add to his ability both against the run and pass. Wise is often successful due to his length. On this play we see Wise (right defensive end) explode out of his stance and use his inside arm to perfection. He makes contact with that long inside arm first, keeping his outside shoulder clean and allowing himself the opportunity to pivot around the edge if the quarterback tries to escape. We then see Wise’s power, as he keeps his hands over his eyes and drives the offensive tackle straight into the backfield. Putting the tackle on skates, Wise forces the quarterback to abandon the pocket where he is met by a relentless Deatrich Wise. Wise’s effort and motor are both impressive. He refuses to quit on plays no matter where he is on the field, and often chased down running plays from behind. This play shows both the good and the bad of Wise’s game. He understands how to use leverage and angles, bending at his knees and doing his best to get to the edge. However, Wise does not have the explosiveness out of his stance, or while rushing, to win around the edge consistently. While other prospects in this class like Takkarist McKinley play with jet-packs on their back, Wise sometimes looks like he has weights on his back. His long legs hurt his explosiveness, forcing him to take long strides and wasted movements, slowing himself down. Here’s the good part. Wise is able to compensate for this lack of explosiveness with his length and power, shedding the offensive tackle and winning to the inside. Wise isn’t going to consistently be a double digit sack guy in the NFL, but he will be a solid pass rusher who can get 5-7 sacks a season. Wise continues his solid play against the run. As stated earlier, Wise understands leverage and uses his length to his advantage. He does a nice job of shedding blockers on the line of scrimmage, and keeping his pads clean from hands. He doesn’t have the best, or quickest hands, but he certainly has a lot for NFL coaches to work with. On this play we see Wise use his power at the point of attack, striking the blocker with his hands and keeping his pads clean. Reading both the blocking schemes and the running back, Wise is able to be patient, control the blocker, shed the block and make the tackle. To reach his full potential in the NFL, Wise needs to better learn how to use his hands and get a little quicker off the ball. He also must develop better pad level, as he is often times too high off the ball, allowing himself to get washed down the line of scrimmage. The good news for Wise is, all of these things are very fixable. In a draft class which features some of the best EDGE talent in recent years, it is understandable that Deatrich Wise Jr. is getting lost in the shuffle. With that being said, Wise deserves looks from NFL teams as high as in the second round of this NFL Draft. He has the ideal length and size already, and possesses necessary traits to be a successful 4-3 defensive end. While he is not a “quick twitch” player, Wise is a smart, solid football player who can be impactful in the NFL.